Let’s go to Gion festival wearing Yukata! Let’s go to Gion Festival in Kyoto wearing Yukata. Gion festival in July is one of the 3 biggest festivals in Kyoto. The highlight of Gion festival is the parade of yama &hoko on July 17th, but we can enjoy this festival whole in July. I have told my customers who didn’t know about Gion festival they have the chance to listen to the music of Gion festival along Shijo street even in the beginning of July. I have sometimes heard the sounds called “Gion-bayashi” played by Japanese drums and flutes out of the season (autumn or winter). I could hardly believe my ears at first, but it was exactly the sounds of Gion festival. I guess Kyoto citizen living around the area sometimes get together to practice with neighbors even in winter. From this sounds, we can understand how important festival it is for Kyoto citizen. Although the music we can hear all around in Kyoto such as department stores, supermarkets, stations in July are from the audiotape, we can listen to the authentic one at night on July 15-16 in addition to the main parade on July 17th in the morning. Some Kyoto citizen love the parade-eve more than the parade. Many people go for the open air market at Shijo and Snajo area wearing yukata. Please notice that even though we have the parade 2 times on 17th and 24th, the open air market at night is only before the first parade. It’s called yoiyama (16th ) and yoiyoiyama (15th). Many of the Kimono company around here also open their temporary store where we can find reasonable yukata. Although the most of them is in the new buildings, Shiori-an has the traditional architecture registered as the cultural property in Kyoto city. Their yukata are so beautiful that it’s made by kyo-yuzen dyeing. I love the mixture architecture of Western & Japanese style with the beautiful garden inside. Their sense of beauty must be appeared on the nice yukata. You need reservation to visit here usually, but it might be open for everybody during Gion festival. 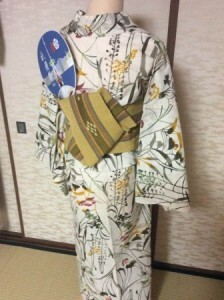 This is also yukata made by Shiori-an. The tying is the most popular and easiest one called “butterfly”. This is the arrangement of the butterfly. It seems difficult, but actually not so hard to practice. If you like more adult-like image, I recommend you the style like folding paper. They are called “kainokuchi”, “yanoji”, or “otokomusubi”. It needs a string (obijime) to tie like kimono. Let’s choose the slender and cooler string for yukata. The material of obi also changes your fashion. Cotton, polyester, and hemp. I like the yellow obi made in Okinawa called Minsa- the best, which really suits to any designs of yukata. Since many kinds of accessories for yukata are sold now, Let’s enjoy Japanese fashion and visit summer festival!